This entry was posted in Family Recipes, Holidays, Pasta/Rice/Soups (Primi Piatti), Sauce/Gravy (Ragù/Sugo), Seafood (Frutti di Mare) and tagged Cooking, family recipes, Food, Italian, Pasta, Recipes, Seafood by ChgoJohn. Bookmark the permalink. I am clapping my hands as I feel I have learned so much which I now have to try myself! I love octopus of ANY size, but usually have access to both the small ones and the ones you seek, ie about 1/2 Kg ++. Have mostly prepared them in the typically rustic Greek way with heaps of tomato, garlic, onions, herbs etc ~ would you believe often ‘stewing’ the larger one whole for about an hour . . . But to cut into such small pieces and have the one interesting recipe now and the umido one hopefully later, is such a gift: – how do the Italians do it 🙂 ! Yours is definitely more delicate and I have never had octopus with pasta so, thank you and let anothetr food adventure begin!! Another great family recipe, John! Your posts usually appear when I’m on my way to work and it’s always a joy to read them on the train. Here I know a shop that sells octopus by the individual leg — no cleaning required and easy to portion. I think you could reduce the blanching water and add it to the sauce, but you’d have to reduce it quite a bit so it may not be worth the gas or electricity to do so. I noticed that many recipes ‘plunge’ (dunk?) the octopus several times at the blanching stage rather than just letting it sit in the pot, but it’s not clear to me why. Anyway, this is definitely something I’ll try as I love octopus but haven’t simmered it in tomato sauce yet. Thanks, Stefan. You’re always so supportive. These posts are published after midnight here and I usually go to bed shortly thereafter. We really are a global community, with me going to bed as you commute to work. I briefly tried to find a reason for dumping the blanching water but didn’t find one. All the recipes I saw did dump it, though. The octopus does give off some sort of liquid while being blanched because the water changes to a brownish tint. Perhaps it’s bitter? If I find a larger octopus, I’ll give the liquid a taste and see what it’s like. Either way, I do want to make Polipi in Umido. Today’s recipe was good but it’s still not the one from back in the day. I’ve cook octopus sous-vide without scalding it first, and have used the juices without any bitterness problems. When reduced a lot, those juices have quite a strong taste though. John is really Nice to see you share food with Zia(bellissimo).the Polipo its Nice on tasty,but not easy to make because if you make a mistake its get hard( plastic tasty).but your lovely Zia with you did great work ,even to serve it with strozzapreti pasta!I really enjoy to see it,thank you for sharing with us! Oh john everything looks good except the octopus, haha! That freaks me out, always has! I love the other flavors and the marjoram in the recipe. Your dishes always look so beautifully presented! I have such good memories of octopus, caught and cooked, on the Greek island of Skiathos, many years ago. It’s not something I’m going to get into cooking myself, but octopus is a favourite dish along this coast of France. That sounds wonderful, Roger. Seafood of any kind that fresh is a transcendent experience. I wish I had thought of octopus when I was in Greece. Next time, I’ll be sure to drink the ouzo after dinner. Whichever way you serve sounds lovely John. Would you consider serving the polenta in a shallow bowl make a hollow and form a nest for the sauce; as you would for polenta con funghi. John you have put so much work into this recipe to make it perfect. So much so I want to try it. Octopus isn’t something I buy in England, I see it at the fishmongers and wonder what people do with it! They must sell quite a bit to keep stocking it. In Greece as a child we used to see the boats out at night with lamps and spears catching them. They were very close to the shore line which made me think that when I went swimming during the day they were there right underneath me and at any minute a tentacle could reach out!! Thank you for a lovely post. Hi John I love octopus but never prepare it at home because it all seems a little hard. Your recipe however looks very easy and tasty. Thanks so much John for the idea. I’ve made octopus chew toys for the dogs once or twice, but only unintentionally. I learned a lot from this post; will have to try this recipe sometime soon. I fully understand. I feel much the same way about the really big ones. These little guys are far less daunting; their eyes have all been closed. In fact, all you see are 2 little bumps. It would be far more difficult if it was watching me as I worked. Yikes! Great tutorial on how to clean octopus. Love how you are able to make it sound easy and doable. I have images of priests gagging while trying to tear away the shoelace pasta from around their necks, how hilarious! Will be carrying a smile on my face the whole day with these images. I remember my father making octopus dishes but I never did, one of these days. Thank you, Norma. I must admit, until I cleaned the first one, I thought it much more difficult than it actually was. Perhaps I’ll feel differently once I find a larger one but these “baby” octopi weren’t at all difficult to prepare. Yes, that legend of the poor priests being chased and strangled is really something, isn’t it? To funny. I love your posts and learn so much every time I visit. Thanks, Susan. That’s a very nice compliment to leave. As an octopus lover, you may enjoy it served in humido. Once I find the right sized octopus, I’ll get the recipe together and will let you know. Great! I’ll keep my eyes open and let you know if I find octopus for sale anywhere. We all love octopus as you can imagine. It’s so similar to calamari and you know both of the kids are fiends when it comes to that! They’ve had octopus before too and loved it. I’ve never bought a whole octopus though. I have much the same fear of that as I do a whole fish. I’m not sure I could handle the cutting out of eyes. Still the end result looks and sounds delicious. I like the choice of pasta and how fun to have one with the Bartolini name! On a side note, I thought of you this a.m. I was walking in a haze through the kitchen early this a.m. and stopped dead in my tracks. There in mid-air a few inches from my face was a spider! I was frozen. No one else was awake. Fortunately the little cat came to my aid. He hopped right up and took care of it. Thank goodness or I would have had to wake someone up! 😉 I had a little chuckle at myself and knew you would appreciate that as well. Have a great day John! For the uninitiated, cleaning an octopus can be difficult. If you buy the small ones, Kristy, you won’t even see the eye as eyes. They’ll be closed and appear like 2 little bumps. If you do as I suggested, cutting above and below them, you’ll create a ring and just toss it. Easy-peasy. Thank you but no! I shall squeamishly back away from this recipe and await one with less “legs”. Oh, that is quite the story on the origins of ‘strangozzi’ John. And you’re quite right, you gotta love it! I love the way how much of Italian folklore involves religion in one way or another and how the people are always on opposite sides. 🙂 Thank you for the shout-out. As I mentioned in my note to you, I came across various Bartolini products and it screamed your name to me – I just had to get some over to you. Beautiful use of the pasta, serving it the way you did. I haven’t had polipo in umido in I don’t know how long. I’m going to forward this to my brother and demand that he make it for me! I cannot wait for your Damson Plum Jam recipe… they are everywhere in our farmers’ markets and I was planning on making just that. Grazie mille John! Prego, Lidia! Isn’t that bit of folklore something? One of my favorite things to do, when it Italy, is to order a pasta that’s new to me and ask the waiter the legend behind its name. Often, the explanation will keep us chuckling until the secondi are served. Thank you, Stefano. I consider you and Francesca to be authorities on All Things Italian and really appreciate your kind words. I agree totally with Stefano! A lovely recipe, great post with lots of information, John. Thanks a lot for sharing! Hello, Cambridge! Thank you, Dina, for the nice compliment. I was thinking of you as we watched Anthony Bourdain in Parts Unknown Sicily the other night because of your reference last week to this octopus post (I think it was last week or am I making this up?) He was supposedly on an octopus fishing trip, but another boat off camera kept throwing frozen octopi down for him to “find” and he was pretty upset about the fake scene. They beat the now thawed octopus against a rock to make it tender, something I hadn’t seen before fresh or frozen! And now today you have made it so simple to understand how to clean one that I might even venture to cook it some time. The eyes would bother me a bit, though! 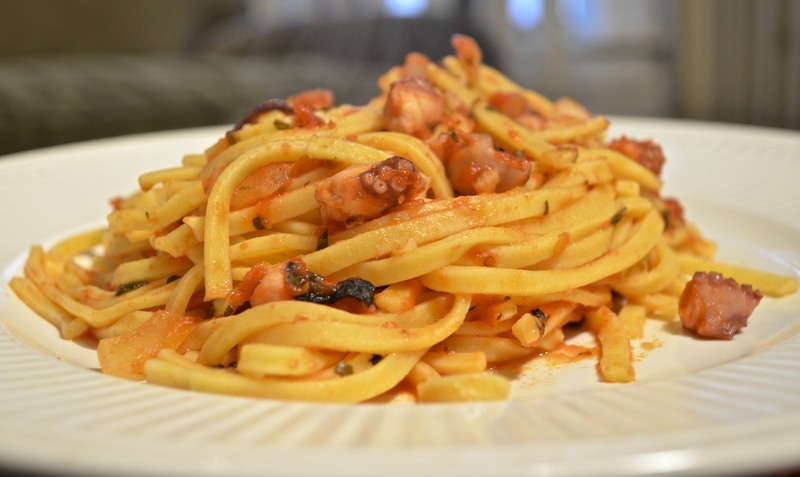 And the strozzapreti with octopus…a perfect strangling combo. 🙂 Really, this dish looks so light and delicately flavored, I can imagine how delicious it is and I love the story behind the pasta. Must go and check out Lidia’s blog, and thanks for sharing! Thank you, Betsy, and don’t think twice about confusing the 2 pastas. I can’t tell you how many times I wrote the wrong name when replying to comments here, let alone when I wrote the post. Before publishing, I actually did a search to make sure I caught all of the mix-ups. I cannot recall where but I heard/read that it was common practice for fisherman to bang large freshly caught octopi against rocks to tenderize them. I, also, read that freezing large ones will accomplish the same thing. Love the title !! I think I’ve told you before that, while living in Malta, one of my very favorite dishes was a pasta dish served with octopus in a creamy sauce. Of course the name of the dish had “polipo” in it…. but I can’t remember it exactly. As always, John, a delightful post!! I wish you lived nearer ’cause I’d invite myself over to dinner for this dish !! Love the octopus, This is a lovely presentation. PM’d you some local chi-town vicinity sources. Really fun recipe today! I’ve never cooked octopus. I know it’s supposed to be wonderful, but the couple of times I’ve had it, it’s been overcooked and unpleasantly rubbery. Admittedly the places I had it weren’t the best in the world. I do know a couple of places where I can buy it, but I never noticed the size – I’ll have to check that out. Great post – thanks so much. Even more than calamari, John, octopus can go from raw to rubber, seemingly in seconds. That’s why I said to taste it as it simmers. It’s been ages since I last ordered it in a restaurant. It’s just too easy to foul up. I’ll go with calamari instead and am rarely disappointed. Thanks, John, for leaving such a great comment. I guess years of catering made me look at check dish for its cocktail party potential. But at home I’m definitely going with the warm pasta version! Hi! And many compliments for your recipes. You’re very creative chef. I love fish and I often I prrepare some dish with it, but until now I’ve never cooked octopus with pasta. So,you give me a suggestion! Thanks and bye 4 now. Hello! Believe me, when we started this dish, I had no intention of cooking it with pasta. I still want to cook one in umido and will once I find the right-sized octopus. Thank you for visiting and for taking time to leave such a nice comment. Really?? Many thanks Dear John. Have a wonderful day! Hi, John. I aways look forward to your posts – such great anecdotes to go with fabulous food. I had no idea that octopus was so versatile. It sound like you and Zia had a gourmet (octopus!) meal. It’s probably good that you went for the smaller urchin and not the four to five-pounder, even if you wished the pieces were a tad bigger (haha). I would happily experience “death by shoelace” eating this pasta dish – YUM. Thanks for sharing. You just have to love a culture that weaves such wonderful stories around its food, as well as being so dedicated to its quality 🙂 I love the end results with the polenta and pasta you’ve accomplished but there’s no way I’d manhandle an octopus dead or alive. Octopus is just divine to eat when it’s tender and the right size but if it still resembles it’s former self, is tough or not cleaned properly, a nightmare. I’ve experienced all those things good and bad. For such a long time I was scared to eat octopus but when I saw how others relished it I had to try, and am happy I did. I was very surprised that you didn’t make the pasta from scratch John, it looks fantastic! I bet the texture was amazing too, what a treat to have Lidia send you such a thoughtful gift. I love the story, it’s these tales that make life interesting for sure. I adore Polipo and have it regularly at my favourite Italian restaurant; I always thought you had to cook it long and slow, but your method looks and sounds quite doable and enormously delicious. Plums are abundant in Bloor West Village right now, we have so many Europeans and I’m sure they are all making a plum cake or dumplings or preserves. I should do the same since I have time now. Thank you so much, Eva. For once, I was more than happy to use manufactured pasta. How could I not be? Bartolini pasta? What a treat and how nice of Lidia to think of us. It is good that you’ve found a restaurant that knows how to prepare polipo correctly. Many do not or at least don’t prepare it consistently. I think those that struggle don’t make it “to order.” It’s a big mistake to try to par cook it and then finish it off later. It goes from tender to rubber too quickly for that. Octopus is a hard one for me. My son adores it, and would love it if I cooked it. But somehow, I yet to bring myself to hold one and cook it, let alone clean and cut it. But I would love to try this recipe. It’s so awesome of Lidia to think of you and send you the pasta packets. The wonderful world of bloggers…you gotta love it. And I loved your little story about the priests…it’s gross and yet fascinating…now I will forever think of strangulating priests when I eat shoestring pasta, hahaha! And wasn’t it nice of Lidia to think of us like that? The wonderful world of bloggers is right! Thank you so much, Tanya. You understand this so well. Because of the lighting, I can rarely take photos in my kitchen. (When I do, you know it.) Taking photos in another room without a sink is a nightmare when the subject is seafood or raw chicken. Max has learned to find a neutral spot and watch me like one watches a foot race. I know where you might find one just the right size John – try the aquarium! I have to admit that dish looks very tasty and if you made it for me I’d not argue, but I’m one of those who couldn’t get past touching it, never mind getting the eyeballs out. There’s just some things I can’t get past but you’re my hero. wonderful post, John! I follow chica andaluza, she is also amazing! Maybe I should celebrate a seafood themed christmas this year, as much as I like turkeys and pork shoulder, I have to admit, that seafood, and specially octopus is my favorite food to eat! Thanks, Paul. Yes, I think the world of Tanya and enjoy her blog. The Italian side of her family is very reminiscent of my own. So many of her memories will trigger my own and the reverse is also true. It’s remarkable. I love the idea of making a squid salad too, which I haven’t made but have had and totally love. I still have to come up with 5 other dishes now! hahah, I’ll figure something out! or maybe I will just combine some fish recipes with some traditional recipes. Will see. Thanks John! I always appreciate your input, seriously. Those hallacas sounds tasty, Paul, though I’ve never seen plantain leaves in any of the markets I frequent. I bet using ceviche as a filling would be fantastic! hahahha, I might end up doing the same 🙂 Btw, plantain leaves.. they’re not common, I agree, and they are certainly hard to find. Easier here in Los Angeles, most mexican stores have them. Their flavor is so unique, if you ever find them, get them, make stock out of them and use them to flavor your favorite meat stew. I believe they taste like christmas, hahahhaah. Ask anyone form Venezuela. They are used in mexican cuisine and southeast asian cuisine as well. It’s good stuff. Not one but 2 pasta forms dedicated to strangling clergy, wow! Lovely to see a pasta and octopus recipe, always a winner to my mind. Thanks. How wonderful that you’ve once again revived a family tradition! I’ve never made octopus myself, but I do find it delicious. And your pasta looks particularly so. I had to fast forward…really really fast, past the photos of the pulpo (Mexican word); but I like the story of the Strangozzi, and I love my pasta to be thick, like linguini, so I’ll have to look for Strangozzi at the market. We have a lovely Italian market in a nearby town, Podesto’s, that I haven’t been to in awhile…soon. Knowing that this post wouldn’t be for everyone, I do appreciate you sticking around, Angeline. When I go to the Italian market, my favorite area — beside the cheese department and pastries — is the pasta aisle. There are so many types and I enjoy finding new ones. I hope you do find Strangozzi. I really did enjoy them. 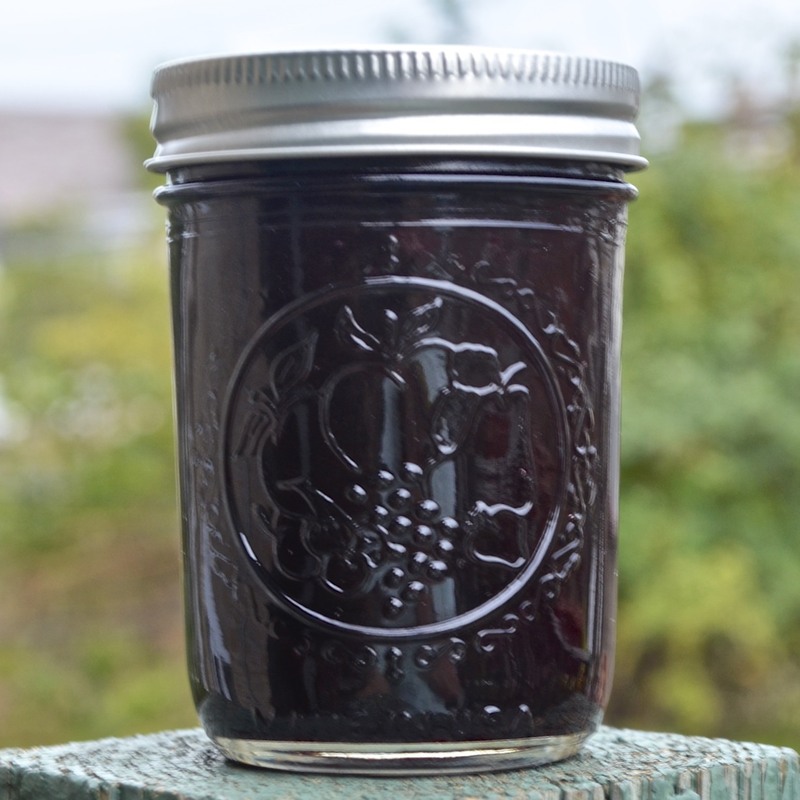 Damson jam was new to me, though I like it. I hope you will, too. Have a great week, Barb. That is so nice of Lydia! Can’t wait to check out her blog! And I have seen octopus frozen, in little pieces, in the Mexican markets. It is a varietal seafood mixture they use for ceviches and such. Other than that the only place I see octopus is at a restaurant and it is so good! Now I’ll be on the lookout! How lovely to receive a parcel from a fellow blogger, especially a pasta package! Italians have such a way with food naming (my favourites are Puttanesca and Suppli al Telefono). Death by shoelace absolutely takes the cake though! This looks delicious John. The sauce sounds lovely and rich. I’m a chicken though, and buy my octopus pre-cleaned. It’s the eye-gauging that freaks me out. You’re so right, Saskia. It was incredibly nice of Lidia to think of us and surprise me with a package. The names of pastas have always interested me. I get a real kick out so some of the, like Strangozzi. 🙂 To be honest, I’m not so sure I could clean a large octopus. The eyes on these “baby” octopus are mere bumps and easily handled. That’s not the case from what I’ve seen of the larger ones. They’d freak me out, too, I’m afraid. Thank you, Saskia. I’m glad you like this post. I’ve eaten very little octopus in my life, mostly on a sushi plate which means, I’ve never tasted it cooked. Raw, it’s a little tough, Is it tender once it’s cooked? Well, the pasta dish does look good and how exciting that it’s served over Bartolini pasta! 🙂 Can’t wait for the Damson plum jam!!! I don’t see a lot of octopus recipes from fellow bloggers. So glad you posted one. This looks delicious. My favorites are the tentacles, YUM! You got me jumping with excitement with “octopus.” When cooked right, this seafood becomes a delicious delicacy. Looks like a yummy jackpot with this recipe. Thanks. Thanks, Debra. You’re always so kind when you comment. There’s good news on the octopus front! A blogging buddy sent me a list of stores in greater Chicagoland that have octopi in assorted sizes. I’ll get this recipe done right yet! Frankly, I found preparing the raw octopus to be relatively easy. I was expecting much worse. Then, too, I think I’d feel much differently if I was working with 5 lb octopi. I’ve watched videos and they’re a bit much for me to deal with. Wasn’t that incredibly thoughtful of Lidia to send “Bartolini” pasta my way? What a treat! Looks gorgeous – what a beautiful pasta, and what a beautiful story. Thank you for sharing it. you can serve it even with polenta? 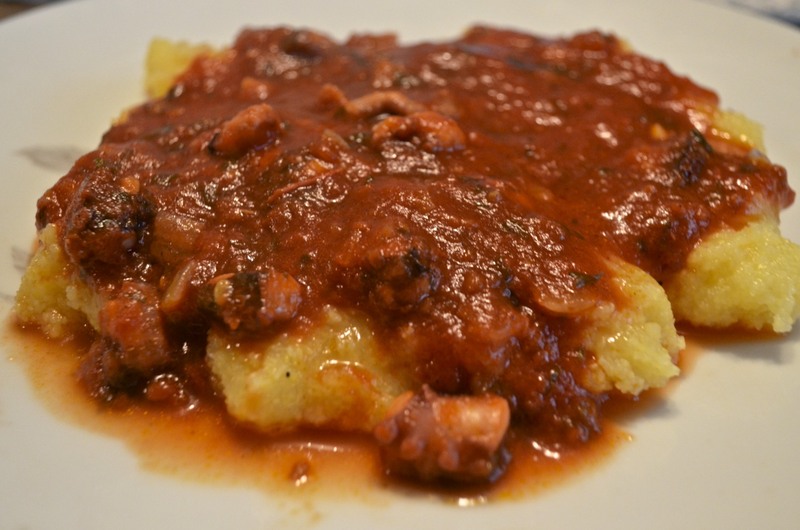 I am from the north of Italy, and never seen polenta served with fish or seafood, looks nice though! Believe me, that was not our intent. When we realized the pieces were too small to be served in umido, we thought serving it with polenta might “work”. It didn’t and that’s when I decided to try again with pasta. This was a much better dish. Buona notte, BAM. Hang on a minute! I am many things but “squid wrangler” isn’t one of them. These octopi were dead. I could never prepare them if live. No way! 🙂 I’ve had octopus sushi and enjoyed it. Served like this, it is very tender — so long as it isn’t over-cooked. Simmer it too hard or too long, and you’ll be eating rubber. This looks really tasty. So similar to our Octopus and Short Macaroni dish here in Greece. A classic dish for Clean Monday, the first day of Lent. We use slightly different spices though, like cloves and cinnamon, which go really well with the octopus. A good way to cook octopus is in the slow cooker! It gets it really tender (like all meats). Great recipe, thanks for sharing! Thank you, Eleni. When you mentioned the Greek preparation, I immediately thought of cinnamon and you reminded me of cloves. Both give Greek sauces such great flavor. Thank you, too, for the tip about using the slow-cooker. I am definitely going to give that a try. It sounds like a great way to prepare octopus. John, your detailed descriptions of cutting out the eyes and the beak, the photos progression of the sizes of the cuts of octopi, the preparation and the consideration of number of diners…I read every word. Wuss that I am, I am wishing for that jar of plum jam as I head downstairs to make toast. 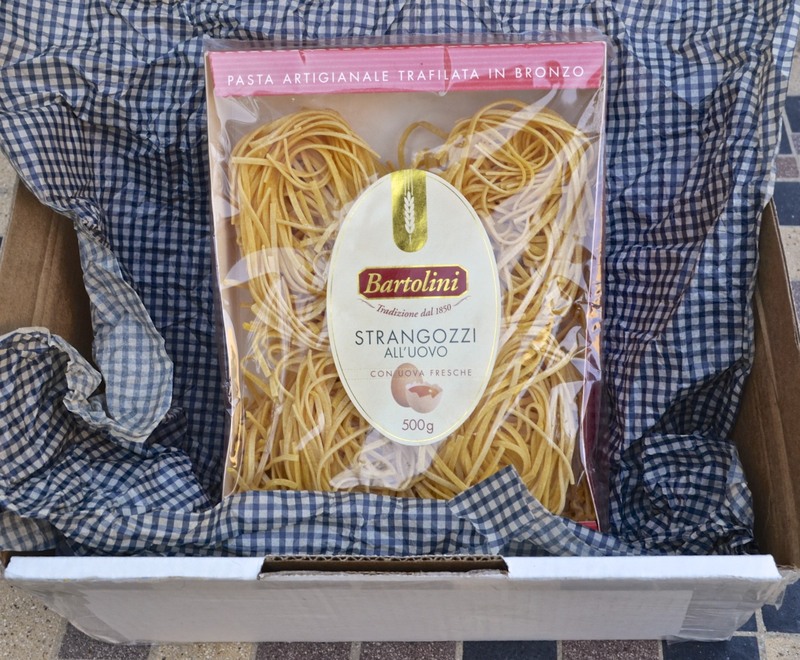 An excellent post and how cool to receive some Bartiolini pasta in the mail? Very cool. BTW I would definitely taste your beautifully prepared dish but I don’t think I could handle those tentacles with the little suction cups to prepare it, let alone cut out the eyes or the beak. Have to run to school. Will share your post with my sister. She’ll love it! Not to worry, Ruth. I could never prepare a large octopus. If the eyes didn’t weird me out, those really large suckers surely would. The ones I worked with here are fine. In fact, the eyes are small, lids closed, and look like 2 small bumps. And you saw how small the suckers were in the photos. No problemo! I hope your Sister enjoys the post. A blogging friend in this area sent m the names of a few stores that stock 1 lb octopi. If I get one, I may re-visit octopus sometime in the future. Thanks, Ruth, for your unwavering support and encouragement. It really does mean a lot. Hi John, I think today I learned something new about Italian culinary traditions! Great recipe – I would love to eat it without having to chop up the octopus! We have our eye on the Strozzapreti to try when we attempt our first pasta making. Firstly, I do hope you get “name” royalties from the Bartolini pasta… it’s only right you know. Then there is the matter of this taste bud tantalising dish – even though I haven’t eaten octopus in many years, I have the fondest memories of it. Now, how the heck do I get a one pound octopus or two to you… I have seen them here quite regularly actually. Have a fantastic day John. Thanks for the compliments. A blogging friend has sent me the names of stores in this area that sell octopi in a variety of sizes. I’ll find one yet! And don’t you worry. I’ll have plenty of them here when you visit. I hope you have a great weekend, Mandy! The octopus and pasta combo looks and sounds totally delicious John. I love octopus, rarely cook with it as my partner is veggie, but no matter. I think my favourite octopus meal has to be at a backstreet café in Athens – fresh octopus cooked over a charcoal grill outside the café. Cheap, fresh and delicious – and we didn’t need to speak Greek to point at the octupus cooking on the grill and grab a table and chairs 🙂 Happy days. This is so droolworthy! I ate octopus for the first time in Hong Kong and just love it since then. Your instructions on how to clean the same are so perfect!! Loved the recipe. Thank you so much, Purabi. You have me wondering how they prepared it for you. I’d love to give it a try. That is a coincidence, Sawsan. Imagine that! I’m touched that you, too, would see that pasta and think to let me know of your discovery. Thank you for being so thoughtful. Oh boy, I honestly don’t think I would ever prepare octopus – just can’t bring myself to do it. However, I really liked learning more about strangozzi and the fascinating story of the priest stranglers. the octopus is here–yay! Looks amazing and wish I was at your table to enjoy. Thinking I’m not up to this task, though have put it on my List 🙂 Thanks for sharing. And yum, will be back for that jam. Have a great weekend John! Ah, I was waiting for that one. Gorgeous. Great pasta dish! Succulent, tasty and 100% italian. Grazie mille, Silvia. Your kind words are very much appreciated. John, in this realm you are a master of storytelling! Whether or not I “can go where you go” in the kitchen, whether or not I have the courage (or time, or access to the ingredients) to tackle what you quite honestly make so do-able, I ALWAYS love reading the story that goes with the dish!! (Imagine how horrible those priests must have been to have the people believing death by shoelaces the most fitting punishment!) great great post! Oh wow, octopus, nice! I have actually only first tried octopus this year (3 months ago to be precise) and I was surprised by how much I liked it. I have never cooked with it before, but I definitely think it’s on my to-do list now! Believe it or not, this smimiliar pasta made some trauma for me…. i guess they did’t slowcooking and direrctly quicky strir fry like a squid…. i think i’m gonna love your version even better!!! Sorry that you had such a bad dish, Dedy. They obviously did not know how to prepare octopus. I, to, have had it poorly prepared and did not like it at all. I hpe the next time you have octopus, it is much better and you enjoy it! I’m usually game to eat most anything, but I remain undecided about octopus, CJ. However, I did enjoy the photos and your as-always charming story of octopi in your family history. Thanks, Kathleen. This is one of those dishes that’s just not for everyone. If you do give it a try one day, I hope it’s well-prepared. Rubbery octopus will definitely turn you against the dish. Octopus? I’m pretty much used to octopus in Asian dishes, but I would love to try your recipe! Lovely post as usual John. I love the serendipity of the family name on the pasta. I follow Lidia and really enjoy her posting too. Given the recent history over here in Ireland, we could have done with strangling a few priests here too. Excellent storytelling and recipe presentation. I love reading your posts. I’ve never cooked octopus. My husband likes eating it but I am perpetually put off by the tentacles and suction caps. Just looking at your close-ups with the beak and eyes made me squirmish…. ugh!!!! 😦 I know that many other meats are just as bad in different ways but the sliminess is a bit of a struggle. Anyway, whew (got that off my chest!). Your recipe looks amazing. Thanks for the thorough instructions and photographs. If I can summon the courage to tackle fresh octopi, this recipe will be first on my list! What a great story behind the pasta and what a lovely surprise to receive in the mail from Lidia! I have not prepared my own octopus but have tried it once in a restaurant. Yours looks great! Thank you so much. I rarely order octopus unless I’m certain the restaurant knows how to prepare it. It’s wonderful when well-prepared but just plain awful when over-cooked. ANd, yes, that was very kind of Lidia to think of us and send us her surprise. I love octopus. It’s such a delightful ingredient to use in cooking. Your’s looks wonderful. I love octopus. Not so much my husband. Will try this with shrimp. Welcome! Shrimp would work fine. I know, I’ve done it myself. Just be careful not to overcook them and you’ll have a great meal. Thanks for the visit and taking the time to comment. Thanks, Kat. I’ve since found a 1 lb octopus and may revisit the recipe once Zia and I prepare it. I bet you can find octopus in your area. You might recall that my Uncle’s family immigrated there, on the Canadian side of the border. There were many Italians living there. If you can find an Italian market, with a fish department, you may be able to find octopus if not fresh, frozen. Wow, two recipes! Both look great. We always like cardamom with fruit, just warms it right up. Thanks, Greg. Cardamom worked very well with these plums. I wish I could have bought more and made a 2nd batch of jam. This one is disappearing fast. This really is a nice compliment. Thank you. What a delicious selection of dishes! Thank you so much. We certainly enjoy them.